I really like to browse the web using the keyboard only, esp. when I’m working not at home and on my laptop notebook. For these occassions accesskeys have always made my life much easier. Since a couple of versions now (I don’t really know when it was added though, but I guess it happened somewhen between 8.5 and 9.2 ;-) ), Opera has a new interface for supporting them. 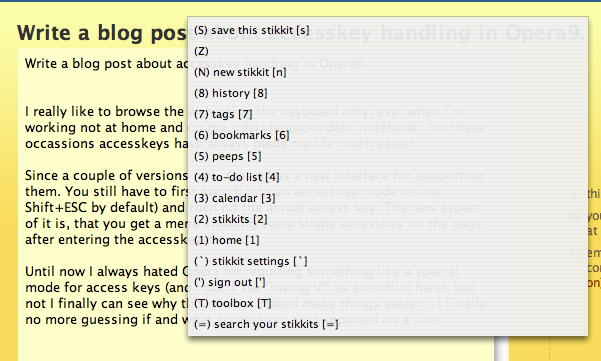 You still have to first switch into an accesskey mode (using Shift+ESC by default) and then hit the actual access key. 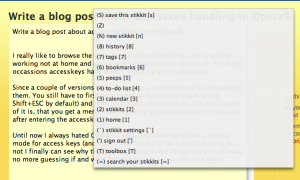 The new aspect of it is, that you get a menu showing every single accesskey on the page after entering the accesskey mode. Until now I always hated Opera for requiring something like a special mode for access keys (and I don’t see “loving VI” as a conflict here), but not I finally can see why this should indeed make things easier :-) Finally no more guessing if and what accesskeys are supported on a site. For normal links the description is taken from the title attribute It does not seem to handle for example the alt attribute of a single image inside of such a link that doesn’t have. As some kind of fallback solution for links where no title is present, Opera seems to use the href attribute in order to give the user some idea of what to expect what might happen.